On July 9, 2015, around 4:30 p.m., Carol Thornberg called the elevator from the 11th floor of the Executive Building in downtown Portland. At the time, the building housed the offices of the Oregon Department of Environmental Quality (DEQ), where Thornberg works as an executive assistant. The elevator arrived with a ding. Thornberg stepped inside and pushed the “L” button. Suddenly, the elevator shook violently, dropped, then jolted to an abrupt stop before dropping again. It plummeted three separate times before coming to a halt between the seventh and eighth floors. The doors would not open, soThornberg rang the emergency bell in the elevator cab. No ne responded. She started yelling. Jeff Kerr, the DEQ’s health and safety officer, heard her cries. He was able to reach the elevator doors around 6 to 12 inches below the eighth floor opening, according to a $4 million lawsuit filed last year by the Dolan Law Group on Thornberg’s behalf. The suit names the Executive Building and Thyssenkrupp, the multinational company that services the building’s elevators. When Kerr tried to manually open the doors, the elevator started violently shaking before slipping yet again. Emergency personnel were called, and technicians from Thyssenkrupp eventually arrived. Thornberg was trapped in the elevator for more than 30 minutes, an event she describes as one of the most traumatic of her life. When the doors finally opened, Thornberg was having trouble breathing, so Kerr and another co-worker helped her to the stairwell, where she broke down in tears before finally making her way downstairs. A friend took Thornberg to the emergency room, where doctors determined she had suffered a stress-induced heart attack. She had surgery the following morning and spent three days in the hospital. But soon she returned to work, where she had to face the elevators. Elevators in Oregon service nearly 200 million trips annually. That figure is based on the industry’s calculus of an average of 20,000 trips per elevator and a total of 9,939 passenger elevators around the state. Yet information about how often elevators malfunction and how many people get trapped is difficult to obtain. The industry is not required to produce safety reports, and public record keeping is spotty. Nevertheless, anecdotal reports, along with data from Portland Bureau of Emergency Communications, suggest the number of people getting stuck in elevators is increasing, and that workforce and workload challenges have created a backlog of maintenance work. Elevator technicians are responding to more breakdowns and entrapments statewide, says Frank Stalen, owner of AVS Elevator, an independent elevator contractor and consultancy based in Portland. Between January 2015 and July 2018, the number of elevator calls to the Portland Bureau rose more than 30%; 342 calls were logged in 2015, compared to 455 calls in 2017. (Records go back only 42 months.) The Bureau does not track the specific nature of elevator emergency calls, says director Bob Cozzie, so this figure almost certainly includes emergencies that are not related to elevator malfunctioning — a heart attack, for example. Many more people stuck in elevators never dial 911, and that either building security or an elevator technician are handling the situation. In many elevators the emergency button does not connect to emergency services but instead directs the caller to a private operator or building security. Despite the fuzzy data, emergency elevator calls do cast light on elevator operations here. In 2016 the Canadian Press examined 911 call data to determine that the rising rate of elevator entrapments was at “crisis level” in major cities across the nation. The paper found that 2,862 elevator rescue calls were made in Toronto (pop. 2.73 million), 1,532 in Montreal (pop. 1.7 million) and 428 in Vancouver (pop. 631,486) in 2014 alone. Based on these metrics, the number of elevator calls in Portland (455 in a population of 647,805) parallels the “crisis” level reported in Vancouver, B.C. As much as the streetcar and mixed-use development, elevators have enabled the growth of Portland and other dense modern cities. The current highrise boom is no exception. New elevator installations around Oregon have risen by more than 35%, up from 221 in 2011 to 315 in 2017, according to permitting data from the Building Codes Division. As Portland builds up, more people are riding more elevators. Yet the industry itself remains shrouded in secrecy. Much like the elevator, the sector operates behind closed doors. Four multinational corporations dominate the market in Oregon. These companies — Thyssenkrupp, Otis, KONE and Schindler — declined or did not respond to Oregon Business requests for comment. “They have a heavy hand. I guess that’s the gist,” says Nicole Singleton, a mechanical engineer and former employee at Turner Construction, where she worked with major elevator contractors in Oregon. The industry, she says, exerts an unusual level of control over the building process, from negotiating contracts to dictating payments. Elevator companies operate with little oversight, save for a few headline-grabbing incidents such as the record $1.3 billion fine the European Union levied against the big four in 2007 for taking part in a market-rigging cartel. Nationwide, revenue of elevator installation and service exceeds $20 billion a year. None of the companies would disclose local market share data or rider-safety reports. Many elevator riders mistakenly assume that the manufacturer, whose logo appears in the cab, is responsible for maintaining the elevator. But manufacturers are only responsible for providing code-compliant equipment upon installation. The responsibility for upkeep throughout the life of the building ultimately falls on the owner. Every elevator in Oregon requires a permit to operate, and state building code stipulates that permit holders must file reports with the state for elevator accidents. Since 2010 an average of 78 reports have been filed per year in Oregon, although these only include accidents where someone is physically injured. Like the 911 call data, the accident report data is murky, as it’s unclear how many of the reports involve injuries directly related to elevator malfunction. Unlike elevator code in Washington state, Oregon code does not yet require a “maintenance control program” for each permitted elevator. This American Society of Mechanical Engineers-defined program stipulates basic requirements for mandatory maintenance and detailed record keeping. “These maintenance control programs are an attempt to mitigate our current crisis,” Stalen says, referring to anecdotal reports that entrapments are increasing. He expects Oregon will eventually adopt the Washington requirement. Reading the account of Thornberg’s accident documented in her lawsuit is enough to raise the blood pressure of almost anyone who has stepped foot in an elevator. There’s something about elevator mechanics — the invisible system of cables and pulleys that whisks passengers from floor to floor — that provokes mild anxiety when they function, and induces primal fears when the slightest thing goes wrong. Elevator phobia itself dates back to the dawn of the elevator age. In the early 19th century, doctors expressed concerns that rapid elevation changes and sudden stops might damage the body’s internal organs. Claustrophobia and fear of entrapment explain the introduction in teh 1920s of soothing “elevator music," a now-pejorative classification. Industry insiders maintain that elevators are one of the safest modes of motorized transit: Each year around 30 people die and 10,000 more suffer serious injuries in elevator accidents across the country, according to data from the U.S. Bureau of Labor Statistics and the Consumer Product Safety Commission. That’s out of some 18 billion passenger trips taken in U.S. elevators each year, the National Elevator Industry Association estimates. But these frequently cited stats say little about mechanical failures and entrapment. Nor do they squelch the water-cooler horror stories. The Oregon Business staff is well acquainted with elevator anxiety. Our office is located on the eighth floor of the Pioneer Park Building, where, for the past year, two Thyssenkrupp lifts have intermittently been out of service. Problems are legion: Elevator doors slide open between floors, cabs jolt in unnerving ways and and emit disconcerting rumbles. Passengers have been trapped in elevators for as long as half an hour. In an email sent to our office, the Downtown Development Group, which manages the building, placed blame on a couple of upgrades. Pulleys and rails aimed at smoothing the ride, as well as seismically upgrading both cars, apparently unbalanced the counterweights, a common fail-safe system that prevents the elevators from plunging to the sub-basement at breakneck speed. As Thornberg’s lawsuit alleges, not all landlords and elevator technicians keep their systems in good condition. And herein lies the rub Elevators may very well be one of the safest types of consumer transit. But that safety and reliability depends on a series of mechanical systems and the care taken by myriad owners. In some cases, negligence may result in little more than a spooky inconvenience. In others, it can prove deadly. “I found that out,” says Thornberg, who declines to speak in detail about the lawsuit as it’s still in litigation — and also because discussing it brings the terror of the incident rushing back. “I don't like thinking about it or talking about it." In the century and a half since Elisha Otis designed the first “safety elevator” in New York City, elevators have shaped American city centers and today continue to fuel next-generation skyscrapers. Yet elevators have received little if any of the attention urban planners have dedicated to buses, rail and other forms of horizontal mass transit. “Rail projects involve a lot of politics. As standalone items, they’ve always been incredibly expensive and disruptive. They’re out there literally in ways elevators are not,” says Sy Adler, professor and associate dean of the College of Urban and Public Affairs at Portland State University. To meet Adler in his north-facing office, I rode an elevator up to the seventh floor of PSU’s Nohad A. Toulan School of Urban Studies and Planning. The scale of Portland’s stump skyline is visible from his window. Leafy trees compete with mostly midrise buildings. One building, the 40-floor Wells Fargo Center, casts the broadest shadow. The First National Bank Tower, as it was first christened, opened in 1972 to widespread criticism. Ada Louise Huxtable, the late New York Times architecture critic, dubbed it a monument to “values of insensitivity, unsuitability and flashy vulgarity.” City elites rebelled, as the building dwarfed much of downtown and blocked wealthy West Hills residents’ views of Mount Hood. The Tower led to retaliatory building-height restrictions. These limits, along with the city’s urban-growth boundary, are oft-cited examples of Portland’s planning foresight. The city’s zoning policies encourage larger towers along transit lines while attempting to keep buildings at a height that maintains view corridors. The elevator industry fuels Portland’s upward mobility, literally. But the lack of industry accountability persists. TriMet, the largest public transit provider in the state, services more than 96 million trips per year and produces detailed reports about ridership, passenger security and so on. The 9,939 elevators in Oregon service nearly twice that number. Yet for the most part, Oregonians have no access to performance data. Law makers in other cities have sought to address mounting entrapments and malfunction. Earlier this year, Ontario legislators passed the first bill of its kind to establish standards for elevator repair time. The new law calls for strengthening and policing maintenance requirements as well as making performance data in multi-family residences available to prospective renters and buyers. Oregonians have no such access to public information about elevators. Thirty years ago, elevators were manufactured in-state. Today mom-and-pop elevator shops can no longer compete with the technological advances and price slashing of the major brands. Elevators are often produced in overseas facilities, though the major companies do maintain a few domestic factories. Otis, for example, operates a major production plant in South Carolina. It’s a familiar narrative of mergers and buyouts — one that some technicians say has led in a race to the bottom. The son of an elevator technician, Thompson showed up for his first apprenticeship in the elevator trade the Monday following his high school graduation. He soon got a job at Sturm, where he met his future wife, the great-great-granddaughter of the company’s founder. In 1909 the Sturm family began manufacturing elevators at a time when Otis was one of their few competitors. While they did produce some passenger elevators, the company found a niche focusing on freight elevators, dumbwaiters, sidewalk elevators — what Thompson describes as “everything that’s not the norm.” Everything from pumps to cab interiors were produced in the company’s shop, Thompson says. The company stopped manufacturing its own elevators in 1986, though they still service Sturm-branded equipment as old as a century. Today the company repairs, installs and provides ongoing maintenance for commercial and residential elevators. Thompson says this last summer has seen a rise in new installations, estimating they now install as many as 30 to 40 a year. The distribution of Oregon’s passenger elevators mirrors the state’s population. Nearly 6,000 lifts can be found throughout the Portland metro area, while Veneta and Wheeler are one-elevator towns.In downtown Klamath Falls, the Oregon Bank Building retains one of the last-remaining manually operated elevators on the West Coast. The antique Otis elevator has serviced the building’s seven floors since its doors opened in 1930 — one of two elevators in the state that attracts tourists. The other is Oregon City’s “Jetsons”-esque, 130-foot Municipal Elevator, the only outdoor elevator of its kind in the United States. “At least once a day, we have someone come by who just wants to ride it,” says Oregon Bank elevator operator David Filippe. “We’ve had people from as far away as Germany, Russia and Japan. We tell them about the history of the building and the town — we’re like mobile historians.” But maintaining the building’s charm isn’t the only reason they’ve kept the original equipment intact. Replacing the vintage machines with sleek new ones is staggeringly expensive. “The retrofit to upgrade the elevator that I run cost more than $100,000,” Filippe says. “To totally redo the elevator is several hundred thousand dollars.” A mechanic from the Klamath Falls-based Straight Up Elevator Co. comes monthly to service the elevator, which has a modern backup system in case of disaster. Only 35 licensed contractors in the state are available to service the industry, according to the Building Codes Division, and the rise in new installations as well as the increasing number of older equipment in aging buildings has put strains on the labor market, with the union struggling to ship in talent. Local 23, Oregon’s only chapter of the International Union of Elevator Constructors, has around 300 members. Securing an apprenticeship requires a passing score on a standardized industry aptitude test, but the apprenticeship itself requires 144 classroom hours a year and a total of 8,000 on-the-job training hours. The surge in new construction nationwide is putting a crimp in that pipeline. The latest national index of cranes found Portland outranked New York, D.C. and San Francisco — landing fourth on the list of U.S. cities with the most. That demand gives the multinational elevator companies an unusual amount of leverage in the construction industry. “Contractually working with them, we’re heavily at their disposal,” says Singleton, who is currently employed as an engineer at Phoenix, Arizona-based Layton Construction. While working at Turner, Singleton served as a project engineer on the Lloyd “Superblocks,” where she managed the elevator subcontractors for Hassalo on Eighth. At 1.1 million square feet, it’s one of the largest residential developments in recent memory, comprising three distinct towers containing 657 apartments, nearly 1,200 bike-parking spaces and ground-floor retail and 11 elevators. In a typical contract, Singleton says, the construction firm would pay the subcontractors upon payment from the client. The major elevator companies, however, exert more control than other trades. They require, for example, a down payment before starting fabrication. The companies throw their weight around in other areas. Elevator reps consult directly with the architect to provide the elevator specifications. These instructions stipulate what product should be ordered and how it should be installed. The companies can also have sway over project timelines by dictating specific deadlines to the contractor. In other words, if you want to build a building of more than a few stories, you need an elevator. This leaves everyone from the owners of aging apartment buildings to the developers of gleaming new residential complexes at the whims of only a few major players. Otherwise, you’re stuck climbing 40 flights of stairs. Elevators mirror our changing cities. Elevator technology enables and limits the imaginations of the architects designing the future. They are proxies for rising wealth inequality as exclusive key-card elevators control access to vertical “gated communities.” They reflect our preoccupations with security and are implicated in the obesity epidemic — most office-building stairwells are locked to keep out intruders. Then there’s the elevator pitch, a metaphor for entrepreneurial aspiration. Without the elevator, there is no city. It’s the only way up — and the only way down. Not long ago, Thornberg was once again stranded in an elevator, this time temporarily stuck in the Lloyd 700 building, a 16-floor tower adjacent to the Hassalo on Eighth development where DEQ’s office has relocated. She’d prefer to take the stairs to work, but she says the Lloyd 700 does not give tenants regular access to the stairwell. “We begged them to open them up, but they won’t,” she tells me. “So I don't have another choice." "If I want a job, I have to ride the elevator." 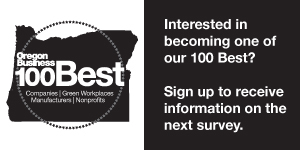 A version of this article appears in the September 2018 issue of Oregon Business. To subscribe, click here.